Just don’t call that heron small! Does this look small to you? The name great blue heron gives off all these positive vibes of a large, regal bird even before seeing it. Sadly, I didn’t find one during my wanderings one day last fall. There is a reason that large birds get an extra 15 points on my bird likeability index. Typically, I find the big ones far more impressive. Even all stretched out, it still doesn’t look particularly tall. However, I did find what looked like a much smaller cousin and was a little intrigued. I had never seen it before. Now I’m not sure who is responsible for naming birds but I have to give them credit on this one. Some less creative souls might have settled on smaller blue heron and the descriptor would have held some weight. The problem would be that I would always feel like I was missing out by not finding the real one – you know the big one. When I checked on this bird’s name, I came up with black-capped night heron. Suddenly I didn’t feel so bad. Maybe this smaller bird had some game. I was happy to ignore the fact that this bird was hardly a night cap since I had the advantage of being able to photograph it during the day. At the end of the day, I decided that I liked the name and the bird … and had forgotten all about that other one. Even looking across the lake, it’s entirely possible the pelican may be a bit larger. My area of south Florida is a very busy breeding area for Great Blue Herons and other wetland birds. We have lots of the one you saw above, though we call them Black-crested or Black-crowned Night Herons, just to keep it interesting ;-)! 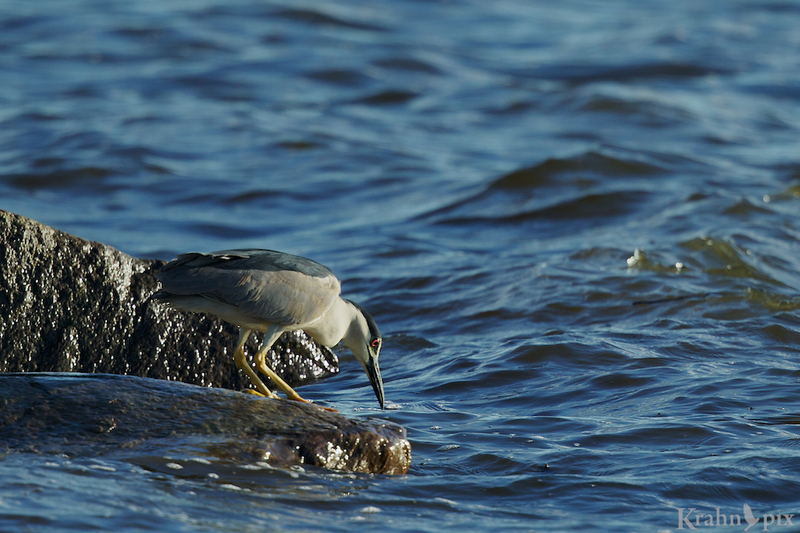 Their cousins, the Yellow-crested Night Herons are often seen here in our wetlands, too. Not only that, just to keep you on your toes, there is another entirely different bird called the Little Blue Heron here – I just happened to see a family this evening! Glad you enjoyed the story. I rarely see herons of any kind so it doesn’t take much to keep me on my toes. I can see from your blog that you have lots of great opportunities to photograph them and some great little gators. Love seeing the B-c Night Heron and of course the bonus penguins! We occasionally see a small black and white BYB type warbler. It’s official name is… you guessed it… Black and White Warbler! How do they come up with this stuff?! I think someone smart like you should start renaming them and I’m sure it would catch on. Oh wait a minute, you already have! The names of various birds and other creatures often makes little sense. There are far too many species with “common” in their names that I never see. Of course, it must be wonderful for your self-esteem to have “great” in your name, but image how the “Least Sandpiper” feels. I think we have already established that you and I have different likeability indices and that smaller creatures have more stopping power for me. You may have ventured perilously closer to my world with this height-challenged heron. Can I interest you in a macro lens? I too have found some serious lack of creativity in the common and great parts of names. I wonder if they ever combined them? The least sandpiper definitely wins the prize. Did they have no heart? I suspect I may venture into your world a lot more than you think. A couple of evenings ago I spent considerable time chasing down young American Coots which fascinated me with their grey colour. The parents have to wonder what went wrong when they look at their own colour. If memory serves me correctly, I have bought and sold three vastly under utilized macro lenses (including the one you own) and determined that I would use my money in other areas in the future. So far so good even with your offer!! I’s just imagining a future post from you entitled “Cute Coot” (try saying that quickly a few times in succession). I suspected you had dabbled in the macro world in the past, but prefer bigger game. I, on the other hand, keep hearing the siren’s song of a 500mm lens. There is a used one at B&H that keeps tempting me–I hope someone else buys it soon. Interestingly enough I have had a germ of a post dealing with cute swirling around in my head – you may just have given it a title. I’m still trying to unscramble my tongue. As for the seductive powers of the 500 – all I can say is that it’s only a matter of time before surrender. I fought it for nigh unto two decades then folded like a cheap tent. Notice how cheap and 500 got put in the same paragraph? Never happened before. If you want to distract yourself, check out the Tamron 150-600. A birder in Saskatoon got some fantastic shots with it and a couple of reviews were good. I don’t know how good it is but it’s a lot cheaper. I remember my friend saw this bird and thought it looked “evil”.I like the green between the bill and the eye.. You got a nice action shot in the first one. That’s amusing. I’m not seeing the evil part but compared to the hawks I’ve recently been shooting this one looks fairly pedestrian. I have to confess that I never noticed that green – it is quite becoming. I’m partial to the action shot too. Most of my prior photography was limited to microscopy – transmission and scanning electron micrographs, and also through the light microscope using Hoffman optics – differential interference contrast. That was some years ago. Yes, I am enamored with life in all its forms. You do take some awesome wildlife photos, which I admire very much! Well that’s taking macro photo photography to a whole different level. It must have been quite interesting to look in on that form of life! I’m pleased that you enjoy my photos. I keep getting drawn back to take them when I’m fortunate enough to find something. I like big birds because they are about the only ones I can photograph. Well that makes perfect sense. I was reading today that pelicans can have a nine foot wingspan and decided that was probably another reason to like them. It greatly increases the odds of locating them in the viewfinder. I saw my first one the other day too and did not know what it was until I looked it up. It just sat there with a Canada Goose, oblivious to me. You have it with the pelicans, a much better bird for your likability index. I am not used to those wading birds being so obliging just ignoring me.I really like your photos, the poses on the rocks are great. Oblivious and obliging can be a rare treat which I quite enjoy! I do find them to be an interesting subject and have seen them a few times since the first one. That is a really sweet name. The great big herons are some of my favorite birds to photograph because they are 1) massive and 2) sit very still. Those are two qualities I quite enjoy when photographing. Otherwise I tend to be just watching and missing. I might agree with your likeability index except for the hummingbird, that magnificent little gem of an acrobat that outshines all them bigger guys. That index is probably due for an update. Acrobatics is definitely worth some points. Each continent seems to have their own versions of wildlife. Each interesting in their own way. Great shots. As Herons go these black-crownednight herons have a real character. Around my way they have an on-going dispute with the turtles who nap on the same logs they want to fish from. That would be a fun controversy to watch. I imagine it would get regularly repeated. Character is always a lot more fun – in people too. Beautiful photos, Lyle, especially the first one. We have Great Blues here, and I have seen them fly overhead on their way to Foster Lake. We’re also not that far from the Willamette River. Bird likeability index? Hmmmm. They are all unique and interesting in their own way . Sometimes a reminder of how brutal Nature can be. We had Tree Swallows nesting here this spring. I saw a Western Blue Jay drag a youngster from the nest and kill it. The parent were beside themselves. Too late, the jay went off with it. I found the headless body later under an apple tree, and buried it. Two more youngsters tried to fledge too early, crashed on the cement floor in the shed and died. I found them and buried them. I went up with the ladder to see who was left. One lonely young one. Later on, that one fledged, flying into my leg by mistake, bouncing back into the shed. Disoriented and frightened, the little one took refuge behind some pots. I extracted the crying youngster, held him/her skyward, and let them take off in open space. The little bird flew circles around the parents who were waiting nearby. I watched the aerial dance of the swallow family for a bit. No, nothing is too small, or insignificant, to appreciate. After understanding a little more of how young creatures grow up, I am amazed that anyone makes it! There are so many obstacles in the path of everything from tree swallows to lions. It can be a cruel and raw world for individuals while the overall species continues to reproduce. There is lots to appreciate in the natural world as well as to be amazed. Still at the end of the day I like some creatures a lot more than others. It makes my photography more complicated than for those who are enamoured with everything. Beautiful bird, and I guess size does not matter…the first shot is incredible, such a good looking bird. Thanks. I have become a fan of this new bird for me. It was fun to watch and photograph.